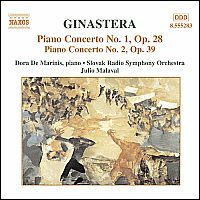 Ostinato has produced recordings of Ginastera's complete piano solo works in 2 CDs, and both of his piano concertos. Dora De Marinis, Piano. Slovak Radio Symphony Orchestra. 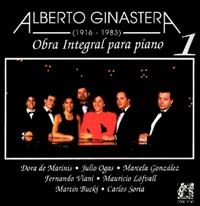 A landmark recording, this is the first CD to date containing both Piano Concerti by Ginastera. Dramatic rhythmic energy, magical atmospheres, and fascinating lyricism combined in a magnificent tour de force where the orchestra and the soloist shine with splendor. These two piano concerti are milestones in the history of the modern piano concerto. * * * * (four out of four stars). Revista Clasica, Buenos Aires, Argentina. For content and clips, click on "Piano works" on left. These CDs has received the ACE (Asociacion Argentina de Cronistas del Espectaculo - Argentine Association of Entertainment Journalists) and the "Diario Los Andes" award. Declerad project of national interest by the Argentine Congress. Both CDs have been digitally recorded, edited and mastered at a professional recording studio, using the latest available technology. Piano: Steinway & Sons concert grand. Recorded at "Estudios Cosentino," Buenos Aires, Argentina in 1995. All CDs include a booklet in English and Spanish with Ginastera's biography and complete notes on all the pieces. Concierto Argentino for piano and orchestra. Dora De Marinis, piano. Master not recorded yet.